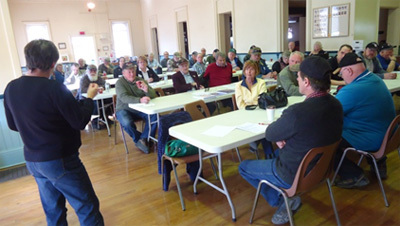 On April 12, 2014 the directors of the Ontario Landowners Association came from around the province to meet at the Town Hall in Norwood. The organization was well represented with many groups sending several members to the meeting. Each group needed to send one voting member. Jack MacLaren spoke of Bob Mackie, President of the Niagara Landowners and his untimely death, February 8, 2014. A minute of silence was observed by all. Jeff Bogaerts chaired the meeting and Liz Marshall took the minutes. Bob Mackie was one of the governors so a vote was taken to elect a new governor. Donna Burns of the Renfrew Landowners was voted in. Much of the discussion centered on OLA organizational issues such as membership fees, county group jurisdiction, and moving the organization forward. Donna Burns walked the director through a questionnaire called “Building our Strength” which helped focus thoughts on how to strengthen the organization. President Tom Black introduced the idea of an International Property Rights Conference planned for October 4th in the Ottawa area. The meeting was very well attended and closed at around 4 PM, leaving time for the long drive home for some of the directors.